Contact us today for your next Dumpster Rental needs! 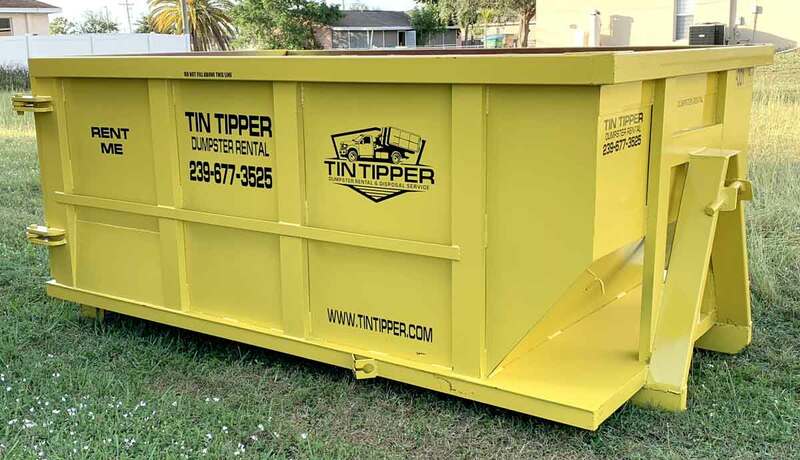 Tin Tipper dumpster rental company is locally owned and operated out of Cape Coral and Fort Myers area. We pride ourselves on being dependable and professional dumpster service to the citizens of Lee and Charlotte counties. Our various sizes of Dumpster rental helps fit your individual needs. 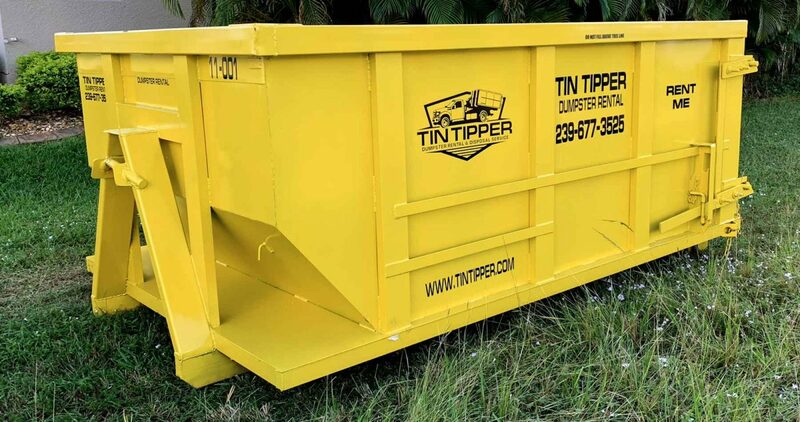 Give us a call today, we can definitely help with your dumpster needs in Cape Coral, Fort Myers, Pine Island, Sanibel, Punta Gorda, Port Charlotte, Lehigh Acres, Estero, Captiva, Sanibel, and other surrounding areas. 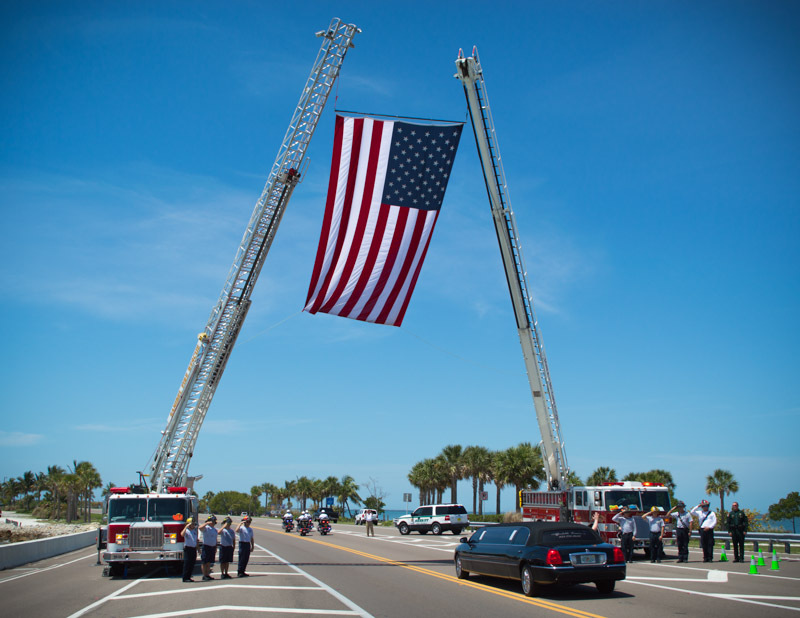 This husband and wife team has a long standing history in the Cape Coral / Fort Myers area with strong professional ties to the public safety community in Lee county. Our goal is to facilitate your next project with our dumpster rental or debris / junk removal services in Fort Myers and neighboring areas. 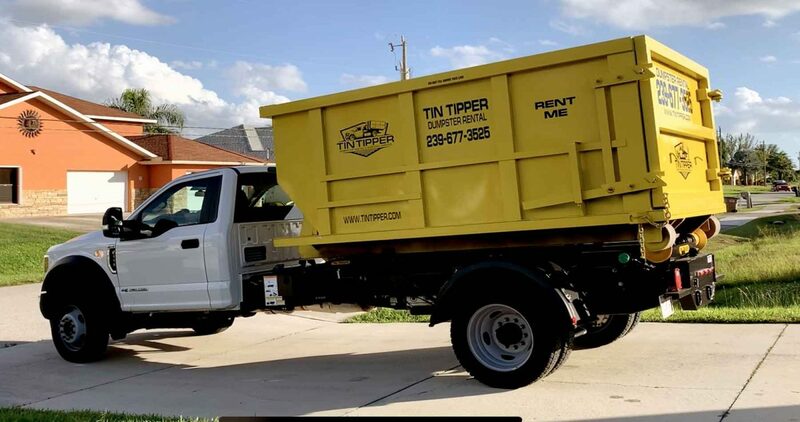 Regardless of whether you are a homeowner renting a roll off dumpster for the first time or a building contractor who uses multiple dumpsters every month, we make the same promise to you – we’ll deliver your dumpster on time, pick it up promptly upon request, and do it all at the best dumpster and disposal prices. 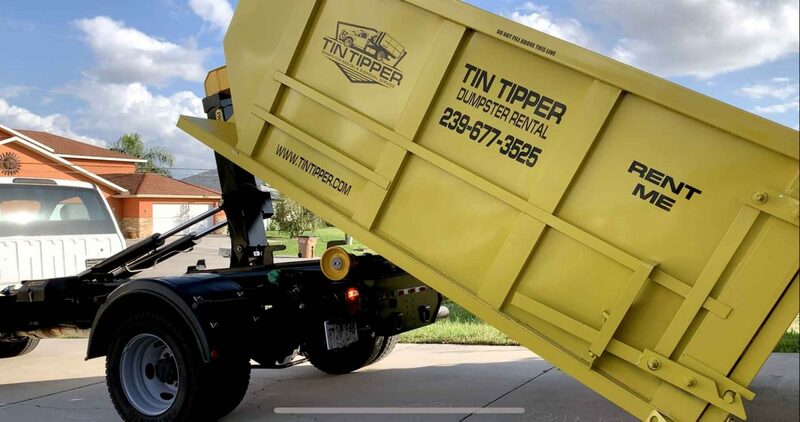 Tin tipper trucks are designed to gently place your dumpster at your choice of location on your residential or commercial property. Most of our competitor's trucks comes with a “roll off” cable hoist system requiring the dumpster to be dragged, pushed coming on and off the rear of the truck, this can potentially add permanent damage to your driveway and property. Here at Tin Tipper we utilize hook lift systems. These Hook Lift systems allows us to gently and carefully set and never drag your rented dumpster along the driveway. This will leave your property damage free. We care about the environment and understand the significance of doing everything possible to help keep our planet clean, especially with the current water crisis in our area. The waste we remove from your project in one of our dumpsters is recycled at the highest possible rate with modern technology we are averaging over 75% recycle rates. 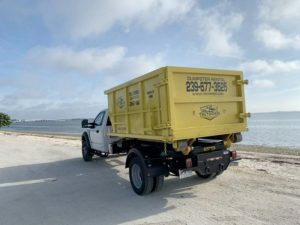 By choosing transfer stations with the best technology for recycling we are able to both protect the environment and deliver the lowest cost dumpsters in the Cape Coral / Fort Myers. 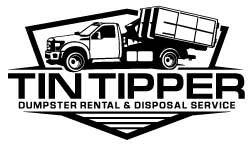 1/2 of Tin Tipper's customers are residential customers performing many different types of projects around the house. We have excellent customer retention who use our services annually for improvements at their residential home, condo, and apartment renters. Some have had one time project that had too much debris for regular trash pick up. Renting a residential container that you fill is definitely the most economical way to get rid of your debris. We promise you that our dumpster will help your next project. Personalized debris removal service. Tell us what you need and when you need it! Dumpster sizes that suit your needs and project. Delivery and pick-up that meets your schedule. Competitive, no hidden fees pricing . well maintained and clean small frame vehicles and containers that will fit in your driveway. Our commitment to a green Cape Coral and Fort Myers area, and clean environment. Courteous, professional family owned and operated comany who answer your call and your questions! No brokers, no shady business, no run-around. Need to rent our Residential Dumpster? Are you ready to start your dumpster rental, click on the this link to continue!